P.T. 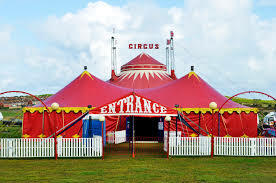 Barnum was the showman of the 19th Century. As he was building his reputation, he created his own, more interesting reality. In other words, he lied…but in a way that got people really excited and made him a lot of money. One of his early profitable hustles was his purchase of a slave, Joice Heth, who he presented as 161 years old, claiming she was George Washington’s nurse. When she died, he arranged for a public autopsy, charging 50 cents per ticket. While working at the Pulmonary Hypertension Association for more than a decade and a half, I observed that one of two things generally happens when people get a serious and incurable illness. They are either destroyed or they become heroes. Josh was one of the heroes. 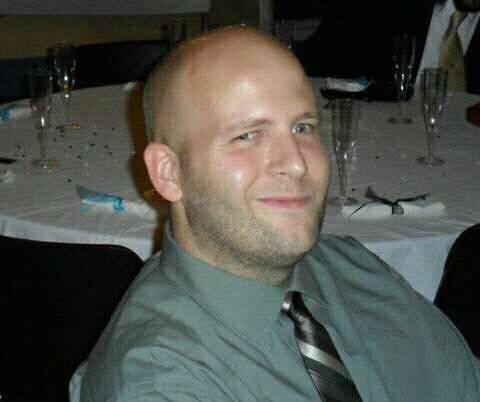 I first heard about him when he had taken on leadership of PHA’s Omaha support group. Our staffer who worked with him, Debbie Drell, told me how the group was growing and how he was reaching out to the larger support group network to learn and to help. Shortly after that Josh’s name came up again. PHA was having a hard time engaging young patients. Josh and several other became part of an advisory – and later leadership – group that defined Generation Hope. PHA’s program for patients in their 20’s and 30’s quickly became wildly successful. The model he helped develop was later used to build seven more special (hard to reach) population groups within our community. When one of Debbie’s staff left, Josh applied. We knew hiring him would not be easy. Besides his pulmonary hypertension, Josh had a second illness…so rare that it was unnamed…one that caused aneurisms to develop in his body. We did hire Josh – and never regretted it. He was deeply respected by PHA’s support group leader network and his fellow staff and fully committed to helping other patients and their families. One evening, Josh and I were talking about the days before we met and he told me that he had gone to Europe and lived in a monastery for six months, so that he could study their texts in the original language. I realized that, while PH shifted the path of Josh’s life journey, he did not let it change who he was…a bright, intense and committed human being. Over time, it became clear to Josh and his doctors that the same medicines that were keeping his PH at bay were accelerating the progression of his unnamed disease. He came to my office to tell me he had made a decision. I didn’t find his suggestion a radical concept so much as a recipe for disaster. 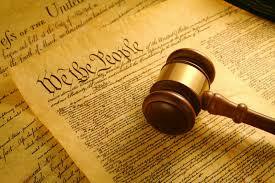 Growing up, one of the most important civic values we learned was that America is nation of rules and laws. If a rule applied to one, it had to apply to all. If rules became tools for power, then what made America different and better would be lost. Over the years, I’ve seen John’s position grow from individual views to a new standard of governance. Put simply, if you’ve got the power, use it to keep it. We all know that both parties use the power of their state majorities to create Congressional districts that maximize safe seats and the largest number of seats for their party. The process is open and claims no logic other than the maintenance of power. The result has been Members of Congress who are beholden to a single ideology, rather than a mix of ideas. Taking this approach to its logical outcome, compromise becomes unlikely, if not impossible. Victory is no longer agreement and progress, it is the destruction of the other party. 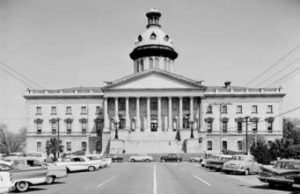 A big next step in making America less is now in process in North Carolina. Forget the names. They’re irrelevant. It is the process that defines us. Candidate A defeats the incumbent, Candidate B, in a close race for North Carolina governor. Candidate B is from the party that holds control of the administrative branch of their state’s government. While the power of the governor to appoint administrative staff and committee members was expanded by his party’s legislative majorities when he came into office, they are now systematically being reduced now that Candidate A from the other party is preparing to take office. To do this is to further pervert our politics. To do this is to trash our political system. To do this is to put another nail in the coffin of American greatness. As Richard Nixon was moving closer and closer to being removed from the presidency, another crisis was looming. That crisis was named Spiro T. Agnew. As Republicans and Democrats came to agree that Nixon’s sin – lying to the American people – was dangerous and unacceptable in a president, they faced the reality of what would happen when Nixon was gone. 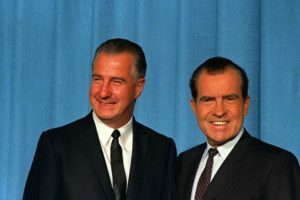 The vice-president, Spiro Agnew, was not fit to serve as president. He was one of the most divisive characters of his time, a rigid and angry person and seemed to have little interest in or knowledge of policy issues, a view shared by Nixon. During Nixon’s second term – which was when the Watergate crisis threatened his presidency – the U.S. Attorney’s office in Maryland began to investigate Agnew for financial irregularities while in state office. He had been Baltimore County Executive and Maryland governor. In return for his resignation, Agnew was allowed to plead no contest to tax evasion charges. He received three years’ probation and a $10,000 fine. In 1981, a Maryland court ordered him to repay $248,000 related to bribes he took while in office. So, eleven months before Nixon’s resignation – as the headwinds were blowing hard against him – an unqualified leader was forced from the position that would replace the president. Under the 25th Amendment to the Constitution, the president nominated Agnew’s successor who then needed approval by both houses of Congress. The then-House Minority Leader, Gerald Ford, became vice-president on December 6, 1973 and, following Nixon’s resignation was sworn in on August 9, 1974 as the only president in American history never to have been voted for as president or vice-president. The CIA has told us that Vladimir Putin rigged our election. It seems to be a part of a strategy to weaken us, decay our alliances and fracture the European Union. In other words, this former KGB man is out to destroy us…in pretty much everyone’s eyes, except President-elect Trump’s. While President Obama’s unwillingness to confront this attack in the midst of the 2016 campaign will be a lasting stain on his legacy, Trump’s unwavering defense of Putin makes him downright dangerous to our nation’s ability to recognize a major threat to the nation and defend against it. A request is now being made by electors to provide the electoral college members with the CIA’s briefing information prior to their casting their votes. In other words, they want the best information on whether the 2016 election was rigged. This is certainly not an easy question. 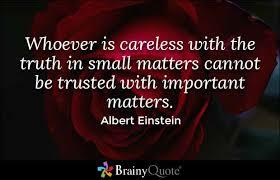 Changes from the status quo never are. However, in times of need and crisis, democracy adjusts for the greater good…and survives. That’s the lesson of Spiro Agnew and it applies today. A democracy cannot be built or sustained on a destruction of truth. It needs to be sought out and allowed to take us wherever it takes us. 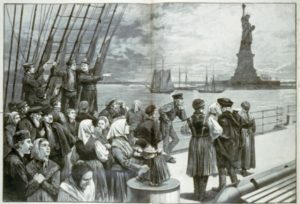 Despite the warts inherent in being a human structure, that is what has always made America great. a Senate Majority Leader who voiced doubts about the veracity of the CIA intelligence…and whose wife has now been announce as President-elect’Trump’s choice for Transportation Secretary. a 74 question memo from the Trump transition team to the Energy Department to get details on individuals, political appointees, civil service employees and contractors who worked on an international climate agreement or were involved in efforts to cut U.S. carbon emissions. Either the conversation will move to alt-news efforts to discredit fact-based reporting on these studies…or, like Watergate, so many years ago, these and other stories will fester for a time and then explode. In and case, there will be plenty of time to address them. 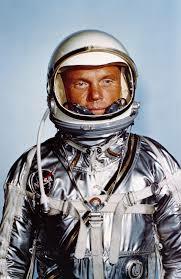 More important today is to remember an American hero, John Glenn. Astronaut Alan Shepard had the first U.S. manned sub-orbital flight into space on May 5, 1961 (the Russian cosmonaut, Yuri Gagarin, flew a month earlier). On May 21, 1961, President John F. Kennedy spoke to a joint session of the U.S. Congress about a manned flight to the moon by the end of the decade. He followed that with a speech to the American people at Rice University on September 12, 1962, setting that effort as a national goal. On February 20, 1962, John Glenn took a huge step in that direction for us all with the first U.S. manned orbital flight. Glenn understood that what he achieved was the product of a national effort. He was the person in the capsule but teams of NASA workers and contractors, national leaders with a vision and U.S. taxpayers made it possible. His death on December 8, 2016 came 75 years and 1 day after the attack on Pearl Harbor. It was because of that attack that he joined the Air Force, flying 149 missions in World War II and the Korean War. 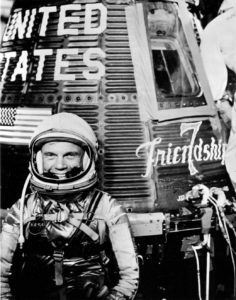 The space capsule in which he orbited the earth was named Friendship 7, a name hard to imagine us using in today’s environment. From 1974 to 1999, he served in the U.S. Senate. During that time, in 1988, he joined the Discovery crew to become the oldest person ever to travel in space. Alan Shepard and John Glenn’s flights took place when I was in elementary school and I remember how they and JFK’s We Choose to go to the Moon speech focused the nation and brought us together. Scientific study became a national priority. He brought out the best in us and we will miss him. My friend Andy Field, posted a wonderful story about an interview he did with Senator Glenn many years ago. I think it tells a lot about the man and am copying it for you. Was lucky to cover and interview John Glenn as a Capital Hill reporter over the years….. great guy and an even better sport. We did a tongue in cheek piece about the goofy Weekly World News tabloid saying he and other Senators were actually aliens. I called his office to see if he would “comment” he played along and even spoke in an alien tongue on camera ..admitting the tabloid had finally exposed his secret..and the Mercury launch was his attempt to return to his home planet. He kept a straight face…i was holding back tears of laughter. What a thrill to have met and spoken with one of my childhood heroes! Thank you John Glenn for a great ride and your life’s lessons. Go with humor. Go with grace. Rest in peace. 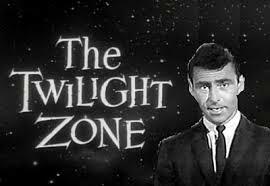 On March 4, 1960, Twilight Zone aired an episode that spoke to Americans coming through the McCarthy era and continues to speak to us today. Titled The Monsters Are Due on Maple Street, it was written by the show’s creator and host, Rod Serling. The story opens on a typical middle class American community. People work together and play together in harmony. They are good neighbors who know each other well. Last night I tuned in to The Gulf Screen Guild Theatre “Between Americans” (CBS, Original air date December 7, 1941) on WPFW- FM. The show had been written by Norman Corwin and was completed several days before its scheduled airdate – the day of the bombing of Pearl Harbor. President Franklin Roosevelt had gotten word to William B. Lewis former VP of Programming for CBS several months earlier and asked for a show to be written about American values to commemorate the 150th anniversary of the Bill of Rights. Corwin was reluctantly recruited. It’s a compelling listen…at least the part that was replayed last night and narrated by Orson Welles. The messages about the importance of the First Amendment, freedom of speech and freedom of the press are powerful…as is the definition of America as a series of communities and neighborhoods, working together through belief in common values. 63 million Americans listened across four networks (that’s an amazing 47%+ of the U.S. population of 133,402,000 that year). Earlier in the day, I watched a wonderful film noir, Northside 777, starring Jimmy Stewart. In it, Stewart plays a Chicago reporter who follows the facts and moves from being certain of a convicted police-killer’s guilt to believing and proving his innocence. It’s a story about truth and the essential role of the press as Americans saw it in 1948, when the movie was made. You came to the U.S. two years ago as a Somali refugee, after six years in Pakistan. As refugees, your family wase no doubt leaving a bad situation, taking you – their future. At about the age of 10, you were old enough to remember why they left. Within two years of arriving here with your family, you had graduated from a community college and gained entry to one of the great public universities in the United States. Your arrival appears to have been assisted with temporary housing (and perhaps more) by Catholic Charities. Your Facebook postings express your uncertainty about where to pray on the Ohio State Campus and worries whether, if you did pray publicly , there would be negative reaction. You felt the U.S. was engaged in a religious war. So, you drove a car into your fellow Ohio State students and, when you crashed it a student ran to see if you needed help and you came out with a butcher knife. You injured 11 people you didn’t know. It used to mean something very bad for a president to lie to the American people. Now, a president-elect is doing just that almost every day. It has become a daily decaying of who we are. 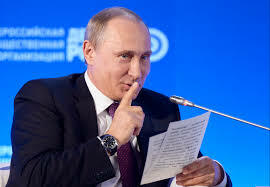 In truth, the only clear fraud is from his Russian benefactors. So, while he at present has no accountability, president-elect Trump at least needs a theme song. Here’s my candidate. Johnny Crawford’s “Your nose is gonna grow”. From 1958 to 1963, Johnny Crawford played Chuck Connors son, Mark McCain, in The Rifleman. And your nose is gonna grow. 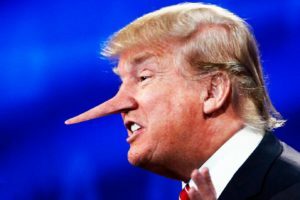 We don’t know yet whether the lies are pathological or strategic…but we do know – either way – they are more dangerous for the U.S.
God help and bless America.